CH-60S would be the most modern medium weight multi-purpose helicopter of US Navy, contract signed and first flight in 1997. It is based on the Navy Helo Master Plan, aims to achieve huge manpower and cost savings while modernizing the fleet for Navy. The CH-60S is a ship-qualified multi-purpose helicopter. 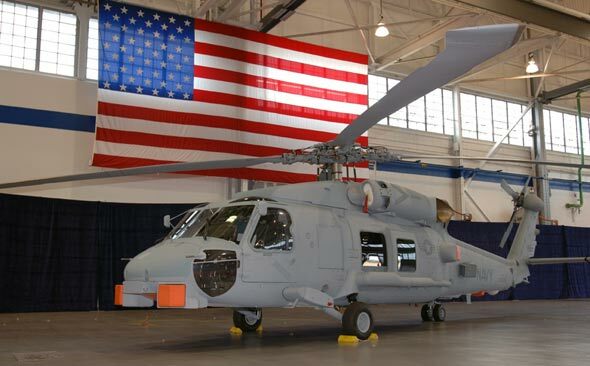 It has the UH-60 Black Hawk's cabin and cargo-handling features, including external stores pylons, and the folding tail rotor pylon and powered blade-folding features of the SH-60 Sea Hawk. This low-risk design will pay off in outstanding cost efficiencies. Cost per flight hour is expected to be less than half that of the CH-46D, which the CH-60 replaces. And, the CH-60S and its advanced version will replace all H-46, H-3, MH-53E, HH-60H and HH-1N in the first 15 years of 21st century. We should be aware of that CH-60S have to do the anti-mine jobs of MH-53E as well as the cargo works. From amphibious and combat search and rescue to battlegroup vertical replenishment, the CH-60 will deliver all the advanced capabilities the Navy needs. For example, its EFIS glass cockpit will incorporate active matrix 8-by-10-inch LCDs, to facilitate pilot and copilot presentations. For extended search and rescue missions, an ESSS-equipped CH-60 can carry up to four external tanks. Its defensive systems include a full complement of radar warning receivers, chaff and flare systems, and infrared countermeasures. And for combat, it can fly with four forward-firing weapons, M-60s, M-240s, GAU-17s and GAU-19s. The CH-60S can carry a crew of four, plus 13 passengers. It has a total payload capacity of up to 10,000 lb. Internally, it can hold two 40 x 48 x 40-in. Navy triwall pallets, weighing a total of up to 4,000 lb. And it can handle up to 9,000 lb on an external hook. Right now the Navy is going to buy 241 CH-60Ss. We must mention the newest naval SEAHAWK SH-60R right now, because CH-60S and SH-60R projects are held together in order to cut down the cost of maintaining these two new helicopters. So 60% of the body stryture of the CH-60S and SH-60R are the same, and the maintaining missions can be done by the same troop and equipments. The training of the manpower is easier, too. The SH-60R will replace the SH-60B, F and SH-2G. The contract was signed in 1993 after the improvement projects for SH-60B and F were merged. The navy would like to have SH-60Rs, most of them would not be new production but converted from the B, F and HH-60Hs. The new suspensory sonar would be AN/ASQ-22 by Ratheyon, with a 2,550 feet rope. The 25 tubes sonar buoyages of B version is kept onboard. 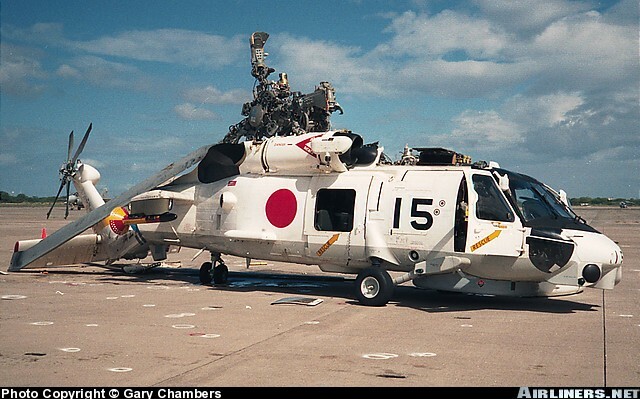 For hunting enemy ships, SH-60R gets a AN/APS-147 ISAR radar. AYK-14 mission processing system can gather all kinds of info from the sensors onboard and display to the crew in one multi-function screen. With its help, the crew can easily tell which ship is using radar to aim at their aircraft. Cuting the weight, the magnetism detector of B version is canceled, but can be added when needed. 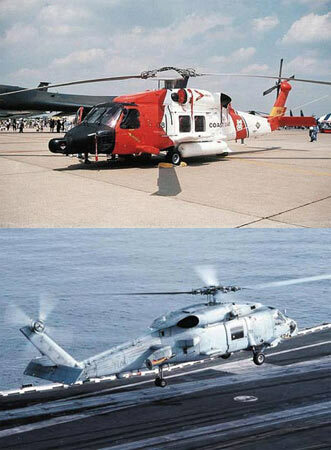 The crew, power plant and armament are the same as SH-60B. The H-60s` unit cost varies with the version. For example, the unit cost of the Army's UH-60L Black Hawk is $5.9 million while the Air Force MH-60G Pave Hawk is $10.2 million. China bought some BLACK HAWKs for high altitude usage. Photo here. Range: Generally about 380 nautical miles (600 km); range becomes unlimited with air refueling capability.